I once heard a great leader talk about about the Three Phases of Change and couldn’t help but relate it to what we’ve seen with our Ducks and college football nationally. Phase 1—Denial: We can all remember the days of being called a “gimmick” offense while we routinely racked up 50 points. We’d hear the traditional powers shame us for not being physical and tough and we’d snicker as those same “physical” teams faked injuries in the 4th quarter in an attempt to slow us down. By the time we played Auburn in the NCG, it was clear that we were changing college football. Which brings us to the second phase. Phase 2—Violent Opposition: This is when people realize that the world has changed and begin doing everything in their power to prevent it (see the last two years of politics). This is because change is scary, and people will do anything to hold onto the comforts of the past. People will do this even when it makes them look terribly stupid. The absurdity and duplicity of that statement was below him, and I think he knew it. Until “up-tempo” offenses took over college football, it wasn’t terribly uncommon for players to die or be hospitalized during summer practice or conditioning drills. The pendulum at that time had swung dramatically toward size and strength at the expense of cardio health (I used to actually lose cardiovascular fitness during the season when I played college football, as we focused on scheme execution to an extreme degree). This was the brilliance of Chip: he leveraged our strengths (speed and athleticism) and minimized our weaknesses (size and strength), as bigger, stronger teams were gassed at the end of drives and at the end of games. Phase 3—Accepted as Self Evident: This is where we find ourselves today. The very programs that mocked our “gimmicks” are now running the same concepts (see Bama, UW, Ohio State, Clemson and now FSU). 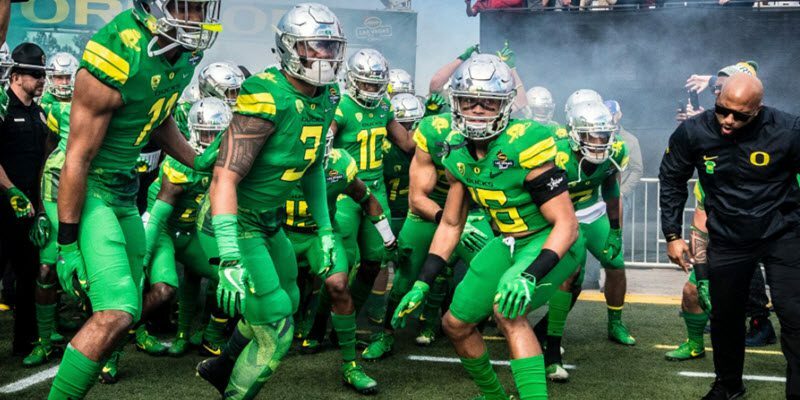 This has led to better conditioned teams across the board and a normalization of the once unique concepts that Oregon championed. 1. Scheme and Substitution: Most college defenses 10 years ago ran some form of a 4-3 base, with outliers running a 3-4. Teams were binary: it was either or, certainly not both. Today, almost every defense is some type of 4-2 hybrid multiple. 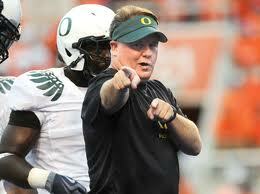 This scheme allows you to throw multiple looks at an offense by changing a single defensive player (see the Duck). As an offense today, you could easily see a 3-3-5, a 4-2-5, a 3-4 and 4-3 defenses—all in the same game! 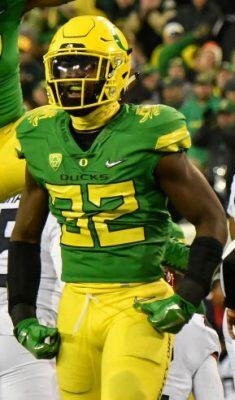 La’Mar Winston is part of Oregon’s change on defense at the “Duck” position. All of this is done an effort to confuse the offensive line and QB into mistakes that slow an offense down. Defenses now substitute much more regularly and more efficiently. Previously, substitutions we generally dictated by the situation; for example, for general downs, short yardage and obvious passing situations. Today, with more hybrid looks, teams will substitute more regularly based upon play count and field position, similar to how you’ll see a baseball player’s pitch count managed. It’s not uncommon to see a defensive line undergo a wholesale change at the 50, another at the 30 and another inside the 10. 2. Streamlined Verbiage: Before the up-tempo, it wasn’t uncommon for an offense to get to the line, shift and motion pre-snap. We call this “window dressing.” All of that required verbiage (original formation, shift, player and motion, play, direction and snap count). All of that took time, and all of that required defenses that were equally verbose, as adjustments were usually made in kind (if you do X then we do Y). Chip saw all of that complication and streamlined it. Instead of using complicated shifts, he figured he could accomplish the same thing by sprinting to the line and sneaking in an unbalanced look while executing a simple play. Instead of multi-sentence play calls, he’d use a picture and a single word. Defenses today have responded in kind; instead of a five-to-seven word play calls, you’ll see a defense use a picture and word that indicates a blitz or “auto-call” (see Nick Saban’s Rip Liz auto-call below). All of this increased efficiency has allowed defenses more time to assess offenses in the pre-snap and to defend multiple looks as a play develops. Aaron Feld is a big part of Oregon’s change. 4. Familiarity: Between teams practicing more efficiently and running similar offenses, players might see the same play 1,000 times before they’ve finished their college career. That allows greater recognition and greater reaction. 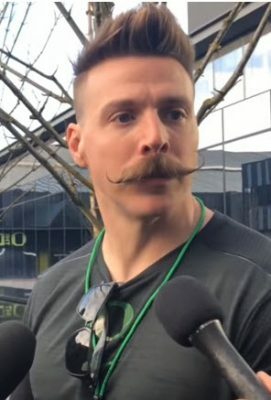 All of this is why I’m so excited about what Mario Cristobal’s staff is focused on. They understand that the landscape has shifted and that to win now, they must win with greater recruiting and greater talent development. We can no longer rely on the “gimmicks” and conditioning advantages because those are no longer unique; they are table stakes. We are building from the inside out (old school), while most of college and even the NFL is building from the outside in. Old is the new new, and I believe that long term, that is going to be what takes us back to greatness.